The bloodiest and most brutal battle on American soil, the American Civil War was fought between the North (Union states) and the South (Confederate states). Triggered by the election of Abraham Lincoln, it began on 12 April 1861 when Confederate forces attacked a US Union military installation at Fort Sumter in South Carolina, and ended on 9 April 1865 when General Robert E. Lee surrendered to General Ulysses S. Grant at Appomattox Courthouse in Virginia. The North triumphed, and the 13th Amendment to the US Constitution - “Neither slavery nor involuntary servitude, except as a punishment for crime whereof the party shall have been duly convicted, shall exist within the United States, or any place subject to their jurisdiction” - was ratified on 6 December 1865. Over 150 years later, this most devastating of conflicts continues to play a critical role in America's military, social, political, and human history (although how it is systematically taught to schoolchildren varies enormously from state to state). But away from the classroom, nothing beats walking in the footsteps of heroes and seeing firsthand the scenes of struggle and sacrifice where an estimated 625,000 men lost their lives. 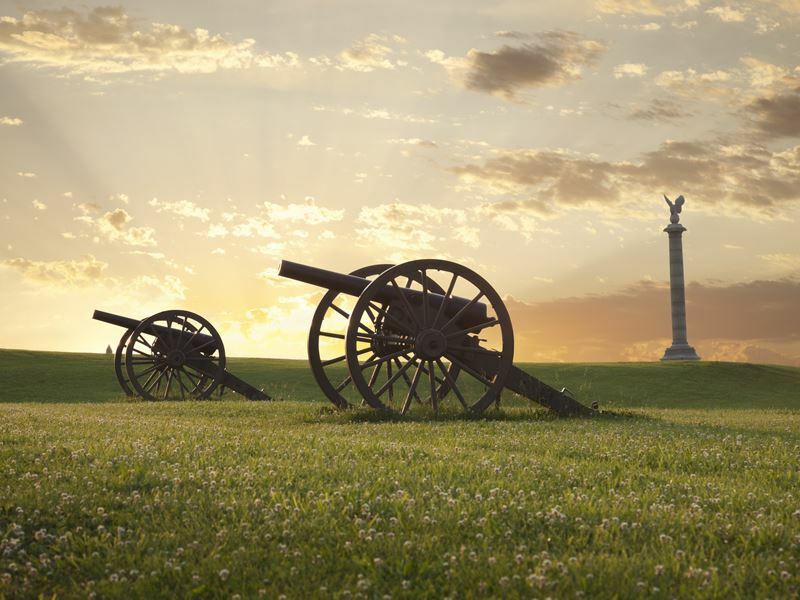 Here’s our round-up of the 10 most visit-worthy American Civil War sites, all of which have been preserved for future generations. Not only do they bring the earliest chapters of the USA’s story to life, but also they will take you back to the time of the blue versus the grey. Now: Myth has it that that the two armies didn’t know the war was already over, but historians feel that is questionable. Today, the site of Palmito Ranch appears much as it did in 1865 - a remote stretch of marshy prairie. There’s little battlefield interpretation except for a marker, some signage on Boca Chica Highway (Texas State Highway 4), and an observation platform that affords a good look at the battlefield. 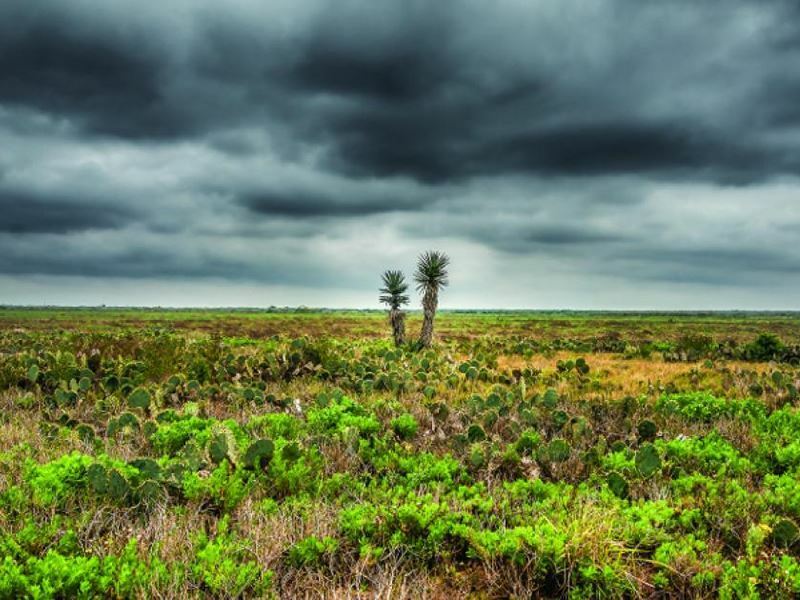 Most visitors combine a visit here with historic sites in nearby Brownsville - a major hub in the international trade flowing out of the Rio Grande. Then: The Confederate’s artillery attack of a tiny brick Union-held fort on an equally tiny island in the mouth of Charleston Harbor is most famous as the site of the first shots of the American Civil War. The first shelling took place at 4:30am on 12 April 1861, leading to the fort’s Union forces (with only 85 men and 60 cannons) enduring a 34-hour military exchange that was a call to arms for both sides. While the number of fatalities was miraculously minimal (only two soldiers and one mule), the fort became a Southern stronghold for most of the four-year war (many historians refer to this battle as the ‘first salvo’ of the bloodiest war in American history). 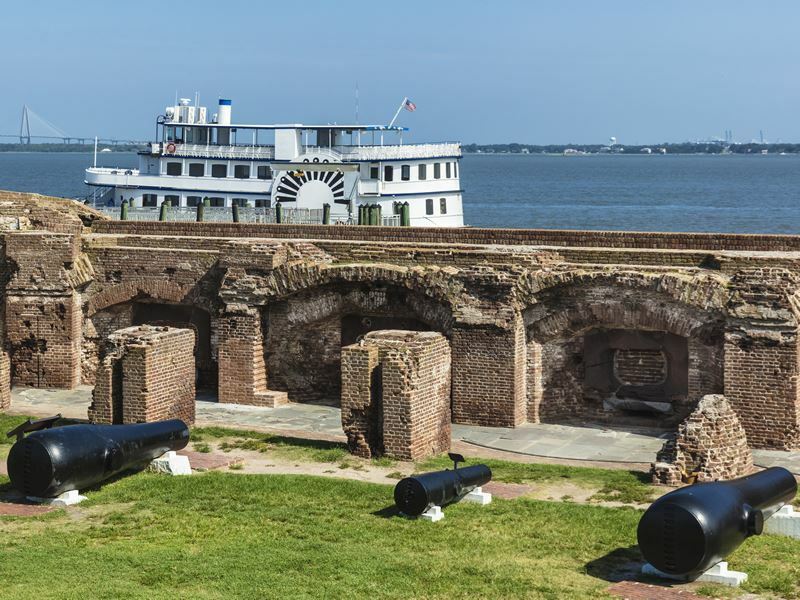 Now: Accessed only by boat from the sparkling Atlantic waterways, daily ferries run Fort Sumter tours year-round, leaving from two departure locations at Liberty Square in Charleston and Patriots Point in Mount Pleasant. Lasting for approximately two hours and 15 minutes, highlights include standing on the grounds where America’s deadliest war began, exploring the well-preserved fort ruins and artillery artifacts, checking out the Civil War-era cannons, spending time at the museum, and browsing the souvenir shop for history books and other paraphernalia. Then: When Abraham Lincoln learned of the Union defeat at Fredericksburg, he declared, “If there is a place worse than hell, I’m in it.” Fought for several days in December 1862 at Slaughter Pen Farm and Marye's Heights, the battle was a crushing defeat for the Union but one of the most decisive victories for Robert E. Lee. Involving nearly 200,000 soldiers (the largest concentration of troops in any American Civil War battle), it resulted in Major General Ambrose Burnside relieved of his command and Abraham Lincoln criticised for not ending the war quickly. 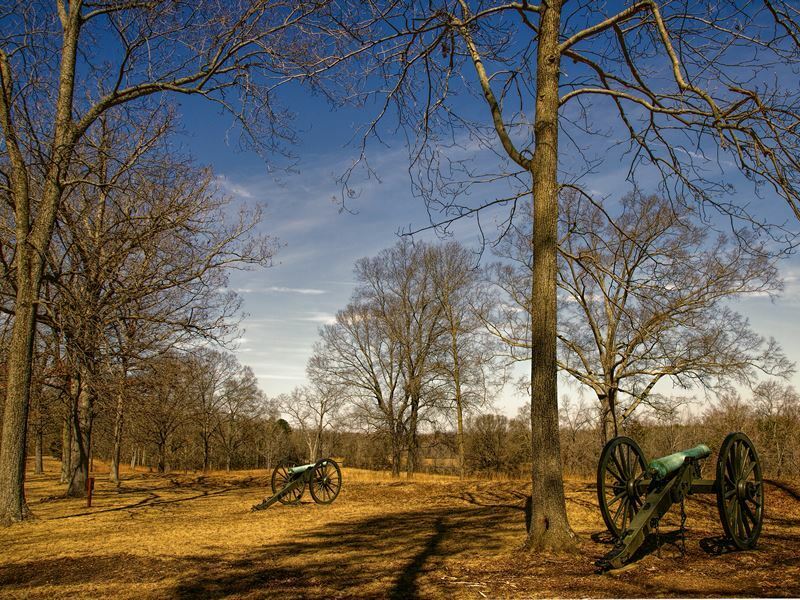 In March 2006, the Civil War Trust embarked on a $12 million fundraising campaign to purchase the 208-acre Slaughter Pen Farm on the southern end of the Fredericksburg Battlefield. Now: Described as the “heart and soul of Fredericksburg”, the hallowed ground at Slaughter Pen Farm where Union soldiers advanced with little or no cover against strongly positioned Confederates on high ground (Prospect Hill) has a 1.75-mile walking trail with interpretive signs. Further historic sites are revealed at the 8,400-acre Fredericksburg Spotsylvania National Military Park, including Chatham Manor, Salem Church, and Ellwood Farm (where Stonewall Jackson’s amputated left arm is buried in its own marked grave). 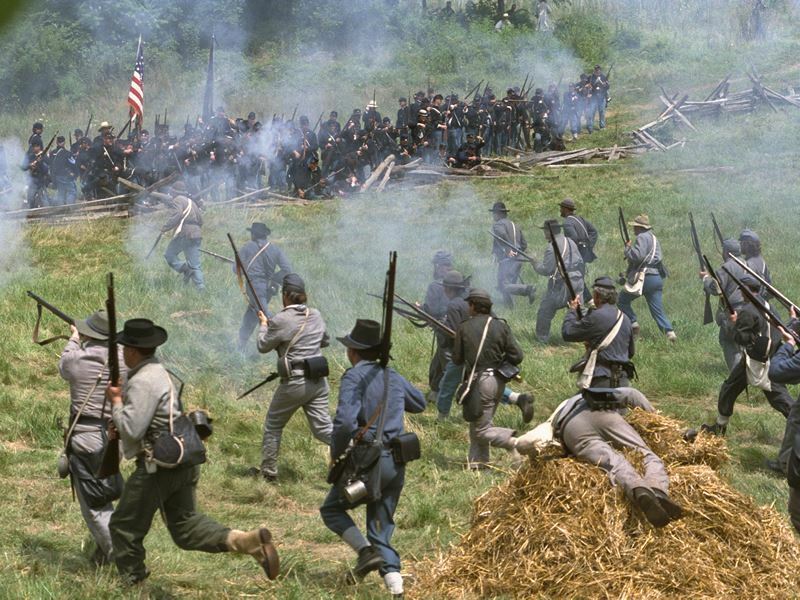 What: Not one but two army clashes on the plains of Manassas, the First and Second Battles of Bull Run (on 21 July 1861 and 28 and 30 August 1862 respectively) showed just how bloody the American Civil War could be. The Confederates won a solid victory in both, bringing them to the height of their military power and dashing any then hopes for the retreating North. 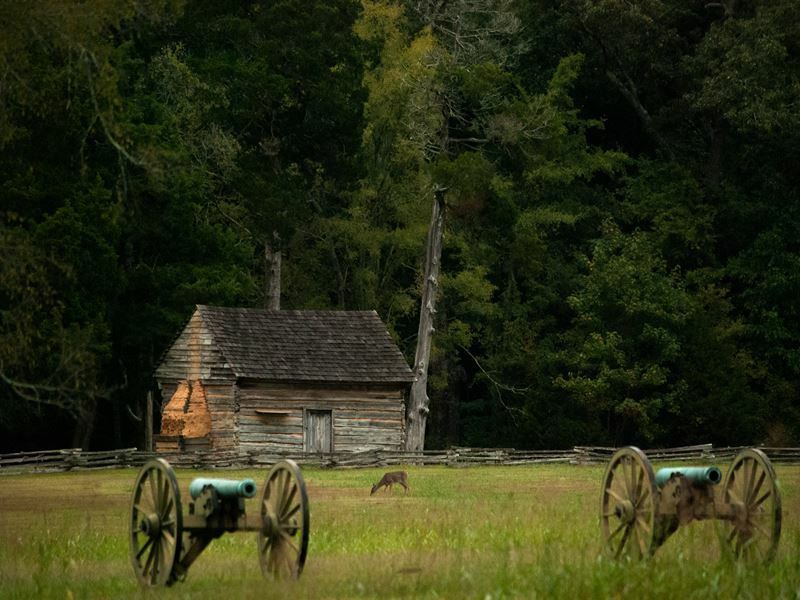 This once-peaceful 5,000-acre slaughter site in the Virginia countryside was also where General Thomas J. Jackson famously acquired his nickname "Stonewall" (allegedly bestowed upon him by Barnard Elliott Bee Junior for his courage and tenacity when leading the troops to battle). Now: The Henry Hill Visitor Centre is an excellent starting point for walking tours around the smaller First Battle of Bull Run field, and driving tours around the much larger Second Battle of Bull Run site. For background on both battles, highlights watch the introductory film, Manassas: End of Innocence, before checking out the museum’s detailed exhibits (uniforms, weapons, artifacts, fibre-optic battle map), hitting the one-mile-long Henry Hill Loop Trail, and visiting the monumental bronze statue of Thomas J. Jackson astride his horse, "Little Sorrell”. Then: A stalemate that left some 23,000 soldiers killed, wounded, or listed as missing in action, the Battle of Antietam on 17 September 1862 was the American Civil War’s single most deadly day. And while the battle did not result in a victory for either side, the days that followed saw the peaceful village of Sharpsburg turned into a chilling burial ground that extended for miles in all directions (because of the catastrophic nature of the battle, exact numbers of casualties were impossible to compile). Following this tragedy, Lincoln created his initial draft of the Emancipation Proclamation, shifting the war's focus from fighting for reunification to fighting for slavery's end. Now: There’s no shortage of landmarks to explore on the 8.5-mile self-guided driving tour through the battlefield; most interestingly Burnside’s Bridge, the Cornfield, and Dunker Church - a humble house of worship that’s one of the most famous churches in American military history. Further highlights include watching the James Earl Jones-narrated introductory film at the visitor centre, stopping by at the Pry House Field Hospital Museum, and walking down the church-like quiet Bloody Lane - the sunken clay road that saw most of the fiercest fighting. Then: No battlefield-hopping tour is complete without a stop at the place where the American Civil War ended. On 9 April 1865, Confederate General Robert E. Lee officially surrendered to Union General Ulysses S. Grant in the parlour of the McLean House in Appomattox Court House. 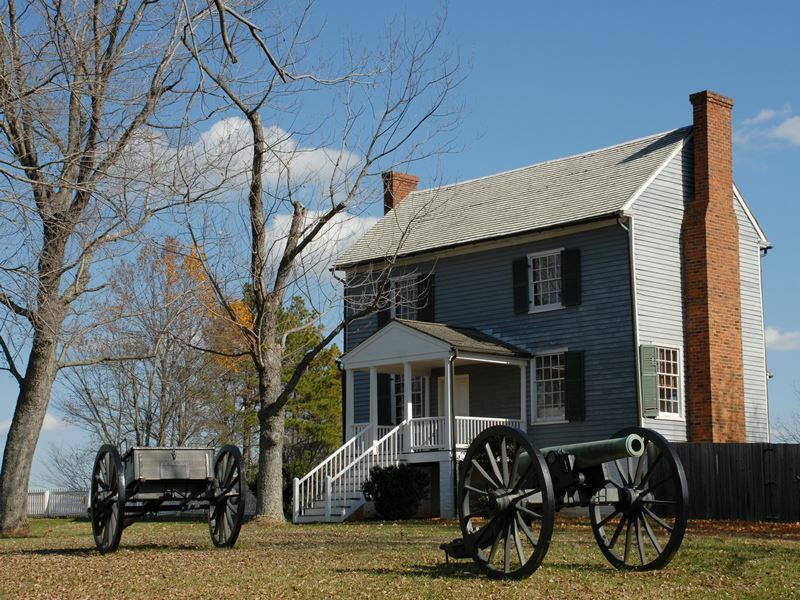 Established as a national monument in 1940 and a national historical park in 1954, the site comprises of over two dozen restored buildings, a reconstruction of the McLean home, the dirt road where Lee’s army finally folded its flags, a Confederate cemetery, and the entire village of Appomattox Court House - the former county seat for Appomattox County. Now: The reconstruction of the McLean House, meticulously built by the National Park Service and opened to the public in 1949, is the obvious highlight - especially the parlour where Lee and Grant met. 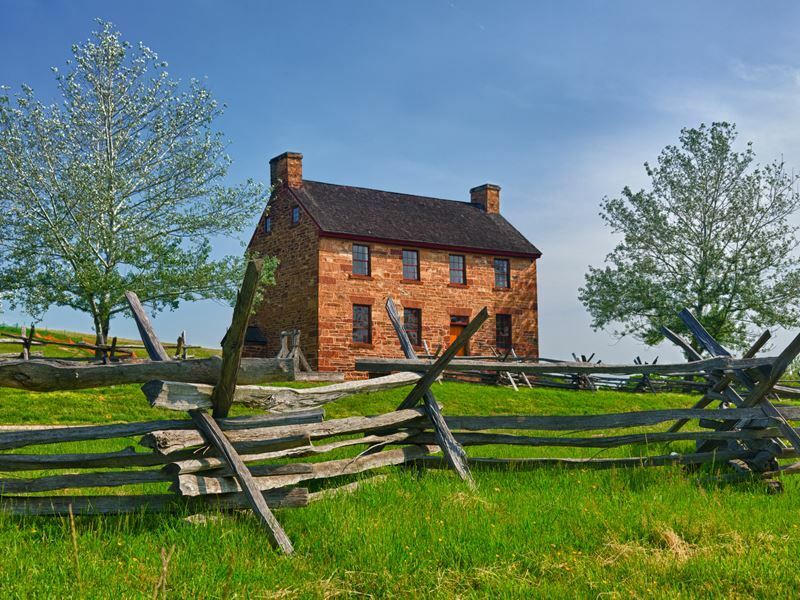 There’s also an excellent visitor centre where you can see the pencil used by Lee to sign the Confederacy’s surrender, tour the Clover Hill Tavern used by Union soldiers to print 30,000 parole passes for Confederate soldiers, and watch a fascinating screening of the park’s film Appomattox, With Malice Toward None (first released in April 2015). Then: Also known as the Battle of Pittsburg Landing, the Battle of Shiloh was the largest battle in the American Civil War’s Mississippi Valley Campaign, resulting in 109,784 soldiers thrown into the fight on April 6 and 7, 1862. In spite of the Union’s victory, the amount of causalities (over 23,000 men were killed, injured, or missing) was shocking to both sides. Nowadays, there are several key landmarks at the wooded battlefield just north of the Mississippi border, including the Shiloh Church, the Pittsburg Landing on the west bank of the Tennessee River, and the Sunken Road - a simple farm road that ended up being legendary as the spot for the fiercest fighting. 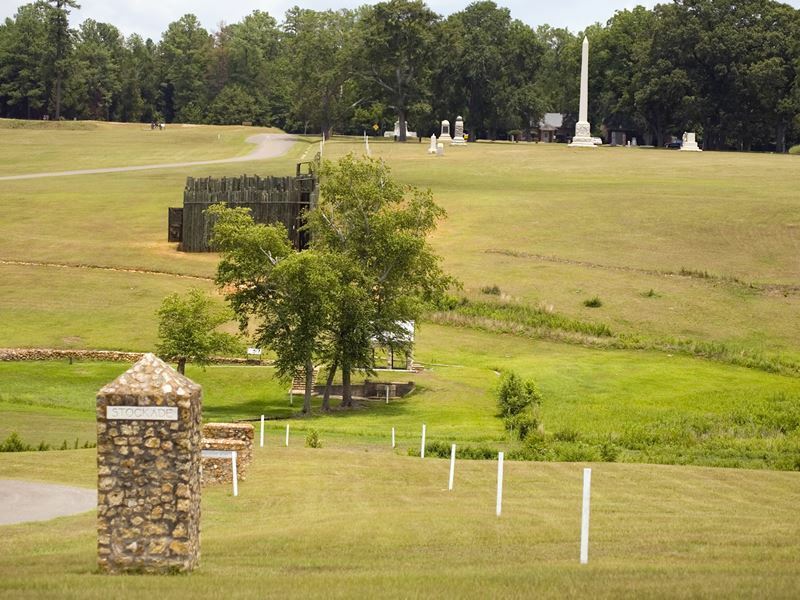 Now: Shiloh National Military Park is home to the battlefield of Shiloh itself as well as a United States National Cemetery for around 4,000 soldiers and their family members. Most visitors take the 12-mile driving tour for 20 tour stops at iconic places such as the Peach Orchard, the Hornet's Nest, the Albert Sidney Johnston death site, and the notorious Bloody Pond. There’s also the option of taking driving and walking tours of Civil War Corinth in Mississippi to see surviving fortifications, homes used by Civil War Generals, and portions of the Corinth Battlefield. Then: Given that death was not limited to the battlefields, the military prison located deep behind Confederate lines at Andersonville is the only site in the National Park System to serve as a memorial to all American prisoners of war. Officially known as Camp Sumter (named for the south Georgia county it occupied), the facility was designed for a maximum of 10,000 prisoners (at its most crowded it held more than 32,000 men, all held in horrific conditions). Of the 45,000 Union soldiers incarcerated during the prison’s 14-month existence, almost 13,000 died (later to be buried in a cemetery created just outside the prison walls). Now: Nothing is more haunting than the Andersonville National Cemetery beside the park’s entrance for row upon row of white headstones. There’s also two reconstructed walls to mark the 26-acre perimeter of the prison itself, and thousands of graves that illustrate the continuing cost of freedom (the cemetery is still in use; around 150 soldiers are buried here each year). The site is also home to the National Prisoner of War Museum, which opened in 1998 to honour all US prisoners of war in all wars (this also doubles as the site’s visitor centre). Then: The bloody scene of a 47-day siege between 18 May and 4 July 1863, the outcome at the river port city of Vicksburg split the Confederacy in two by giving the Union control of the Mississippi River. Over the course of those summer months, Ulysses S. Grant carried out one of the most effective campaigns in the annals of military history by capturing what was nicknamed the “Gibraltar of the South”. 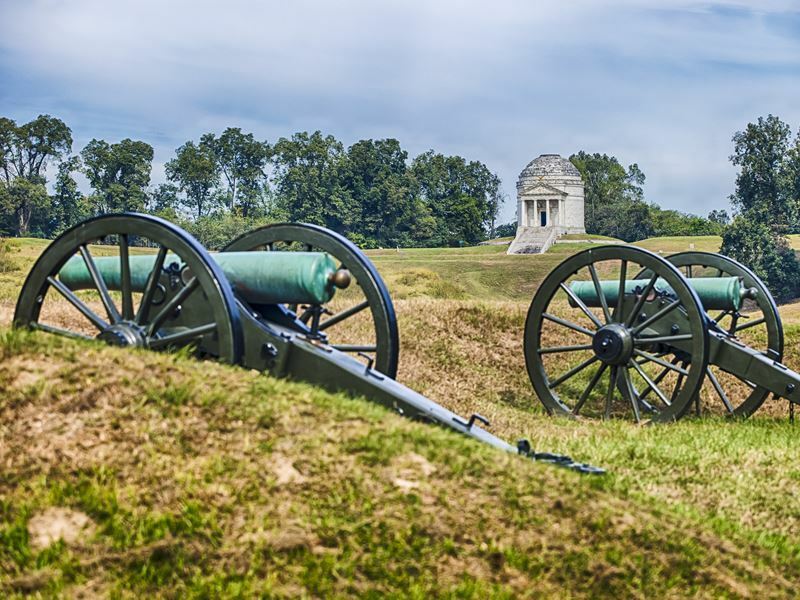 Today, there are 1,325 historic monuments and markers at Vicksburg National Military Park, including the 116-acre Vicksburg National Cemetery - the final resting place of 17,000 soldiers (the site was established by an act of Congress in 1866). Now: Today, the battlefield at Vicksburg features 20 miles of reconstructed trenches and earthworks, a 16 mile tour road that parallels the Union and Confederate lines, 144 emplaced cannons, an antebellum home, a fascinating museum, and the restored Union gunboat-USS Cairo that sunk in 1862 (it was raised in 1964 and is one of only four surviving American Civil War ironclads). The military park can be walked or hiked, but given that it’s a 20-mile loop, a self-driving tour is your best bet (detailed maps are available at the site entrance). Then: The history of the USA hung in the balance on the first three days of July 1863, as the Battle of Gettysburg unfolded in the Pennsylvania countryside. Resulting in 51,000 casualties, this was not only the American Civil War’s biggest battle, but a fight that led to the most bloodshed in the least amount of time. Four months later, on 19 November 1894, Abraham Lincoln delivered the Gettysburg Address (“Four score and seven years ago….”) at the site’s dedication ceremony for the Soldiers’ National Cemetery, connecting the sacrifices of the American Civil War with the desire for “a new birth of freedom” that would bring equality to all. 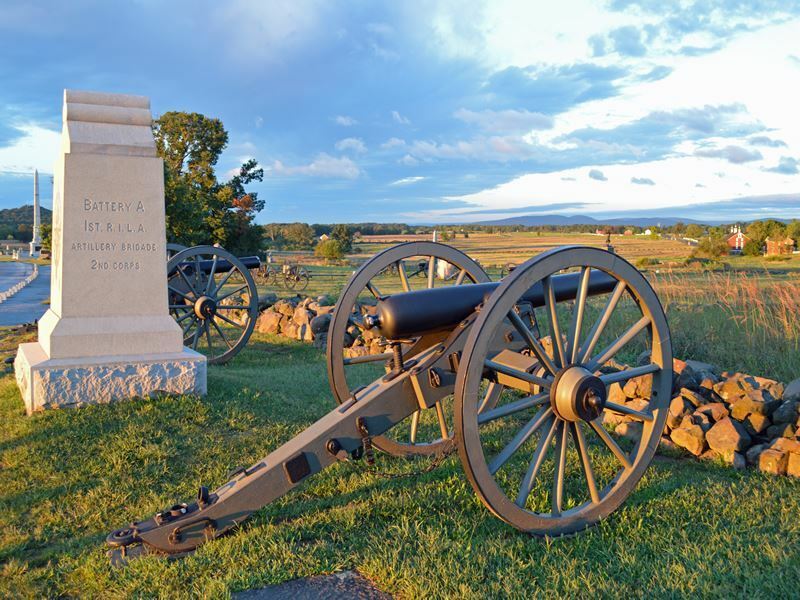 Now: While driving along the widespread battlefield sites is an option, walking in the footsteps of the soldiers at iconic sites such as Little Round Top, Devil’s Den, Cemetery Ridge, Culp’s Hill, and Pickett’s Charge is a bucket-list must. Further battle stories come alive at the Gettysburg National Military Park Museum & Visitor Center - a state-of-the-art facility where you’ll find galleries, interactive exhibits, and multi-media presentations that cover the conflict (there’s also a cinema for screenings of A New Birth of Freedom - a short film narrated by Morgan Freeman).